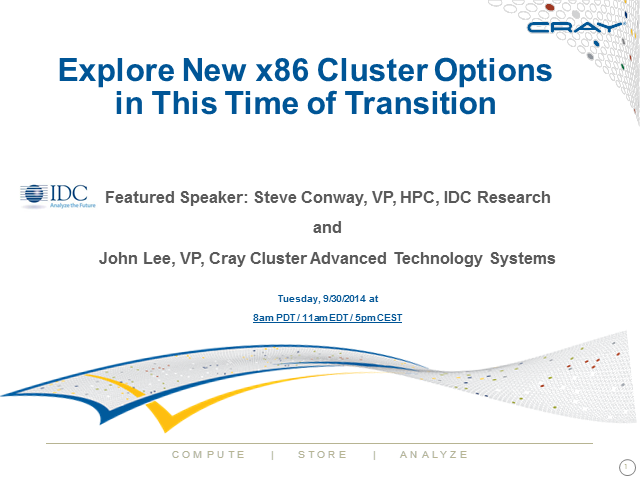 In this webinar, IDC featured speaker Steve Conway, Vice President of High Performance Computing, will present an update on the global x86 HPC cluster market. The presentation will include IDC’s five-year forecast for the medium- to large-scale technical computing and data analysis emerging markets by systems, processors and application middleware. Cray’s featured speaker, John Lee, Vice President of Cray Cluster Advanced Technology Systems, will present the new Cray® CS400 cluster series based on the latest Intel® Xeon® processors with combination options for coprocessor and/or graphics processing unit (GPU) accelerator technologies. The presentation will be followed by a Q&A session with the presenters. Sign up today to attend or receive the webinar recording. Global supercomputing leader Cray Inc. offers a comprehensive portfolio of compute, storage and data analytic solutions. With our expertise in clusters, supercomputers, storage and data analytics, we enable technical and scientific computing to achieve fast application results for real-time discovery. You can learn more about Cray by visiting www.cray.com. Roger Smith, Mississippi State University and John Lee, Cray Inc. In this 1-hour webcast, Cray customer Mississippi State University will share best practices in maximizing datacenter energy efficiency and explain why they chose the Cray® CS300-LC™ cluster solution based on Intel® Xeon® processors and Xeon Phi™ coprocessors. Topics will include architecture and facility considerations such as site selection, risk factors and issues impacting TCO. Attendees will learn about key benefits of the CS300-LC’s innovative design—which uses warm water heat exchangers instead of chillers to efficiently cool the system and maximize performance—as well as remote monitoring and cooling system management. A Q&A session will be held following speaker presentations. Sign up today and join the conversation! 2. Achieving significant power savings, reliability and performance scalability with managed cooling control. Cray is a global supercomputing leader with a comprehensive portfolio of compute, storage and Big Data analytics solutions. Cray’s expertise enables fast application results and real-time discovery in technical and scientific computing. The High Performance Computing Collaboratory at Mississippi State University is a coalition dedicated to advancing computational science and engineering using high performance computing. Mississippi State consistently ranks among the nation's fastest academic computing sites on the TOP500 list.